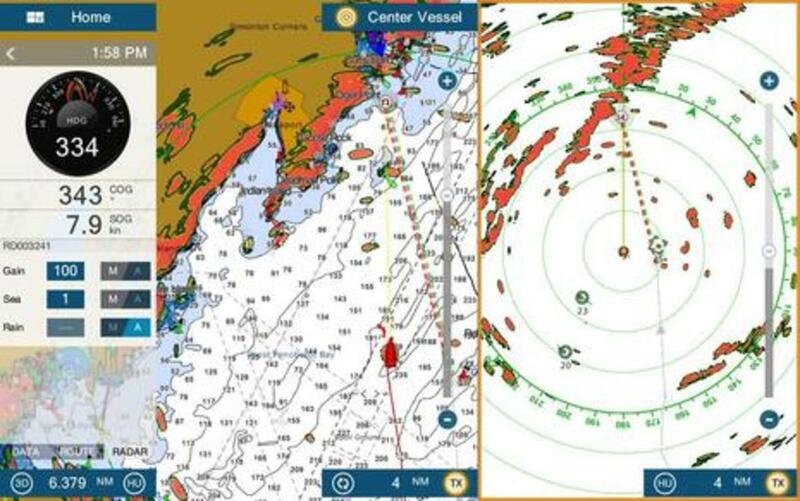 After many hours testing a NXT radome on Gizmo in often busy Maine waters, I believe that Furuno&apos;s bold "Radar Redefined" claim is completely justified. This radar is so smart that it makes sense to run it in broad daylight. 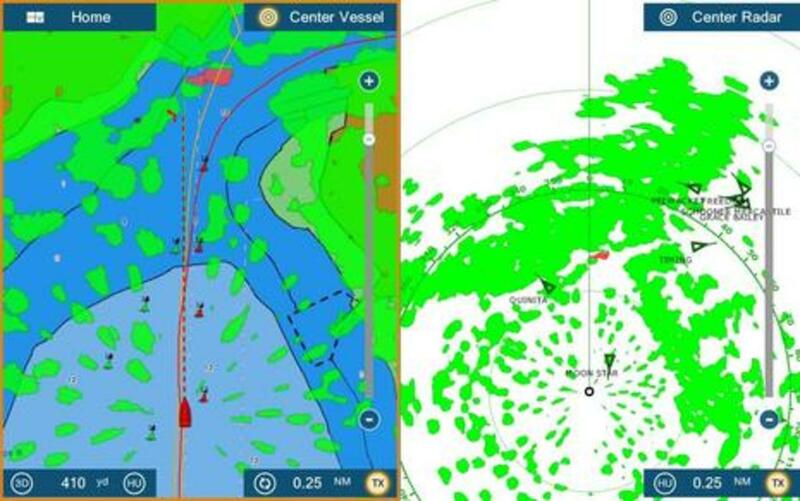 Brightly highlighting the one vessel (above) moving toward me in Camden Harbor&apos;s forest of moored and moving boats is just one example of its highly automated and intelligent features. I fear that many readers will suffer radar jealousy as I detail what I&apos;ve seen so far, but let&apos;s look at the bright side and honor Furuno for setting a significantly new performance bar that other major manufacturers will hopefully try hard to attain. First, let&apos;s consider the hardware involved. 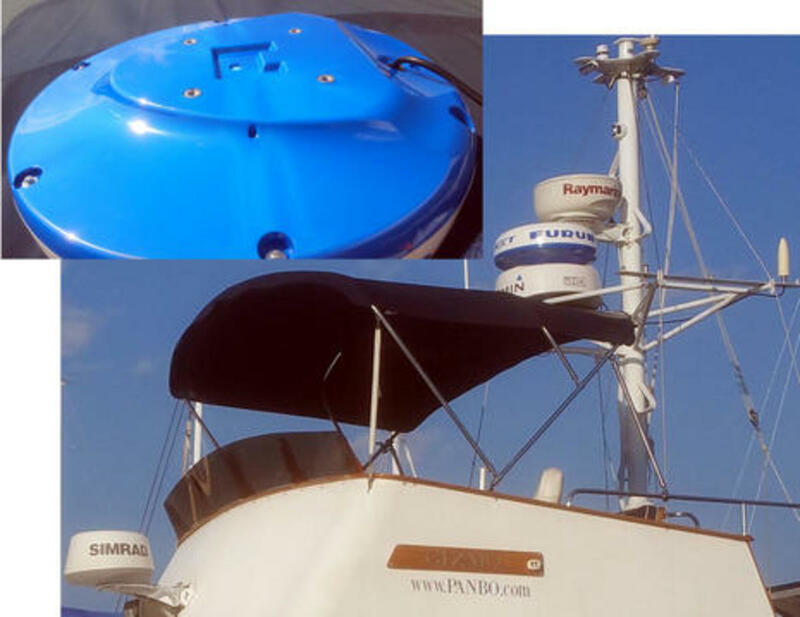 The Furuno DRS4D-NXT is a 24-inch radome (with an unusually low 8.7 inch height) that works with NavNet TZT and TZT2 multifunction displays. 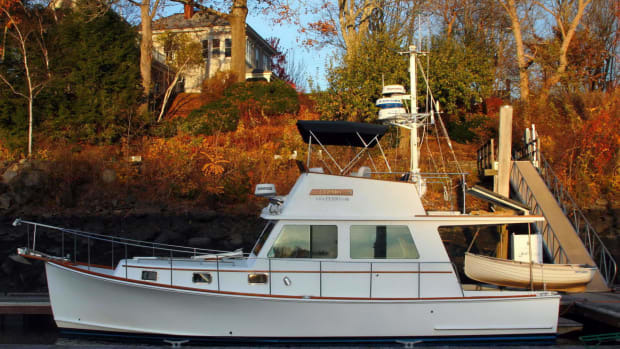 I&apos;m testing it with a 12-inch TZT2, specifically known as a NavNet TZTL12F. The TZT2 hardware and software are quite different from the TZT, and while Fred Khedouri nicely shared his first impressions here last summer, I plan to add my two cents in a future entry. I will, however, point out aspects of the new TZT2 interface that add to the NXT&apos;s easy-to-use high performance. Installation is simple, too. Up on the mast a pigtail coming out of the radome plugs into a combined Ethernet and 12v power cable which splits at the helm end, Ethernet plugging into the TZT2 (or a Furuno network), while the 12v wires only need a 2.5 amp supply as NXT is a solid-state radar using semiconductors to transceive pulses instead of a traditional magnetron. 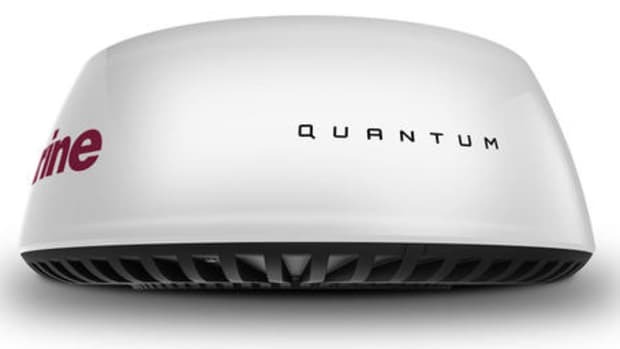 That also means that the NXT goes into standby and transmit modes very quickly and does not emit dangerously high power microwaves. 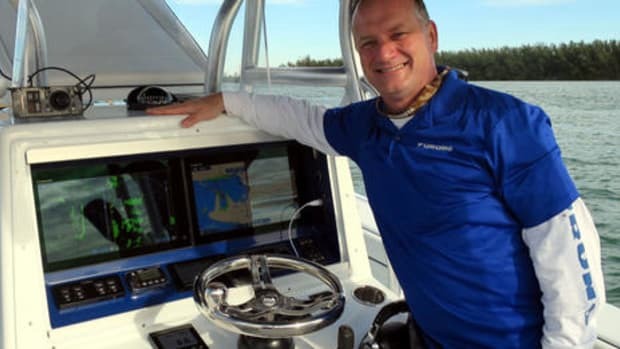 While it&apos;s great that Furuno (plus Garmin and Raymarine) joined the Navico brands with solid-state radar this year, I got especially excited about the Doppler radar target speed feature that Furuno (and Garmin) demonstrated at the Miami Boat Show. 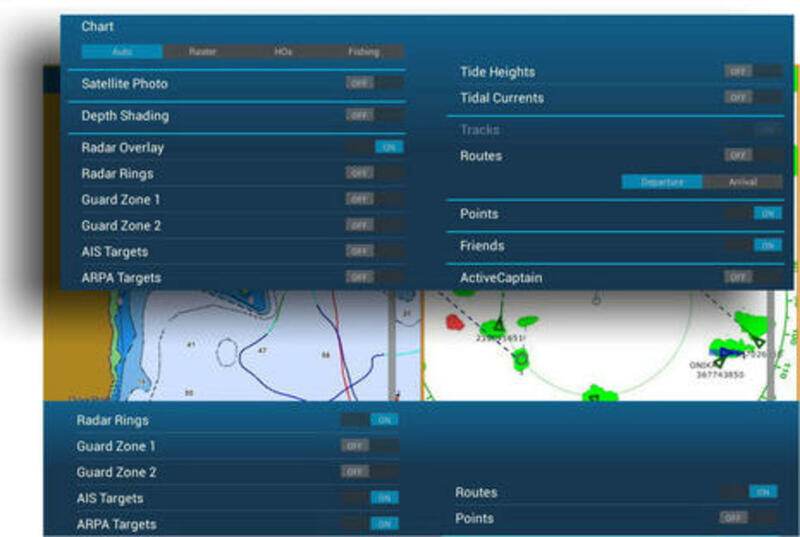 Well, Camden outer harbor can be an even more challenging target environment and the NXT Target Analyzer feature has consistently nailed it. All those green blobs are boats (some several boats), and a few of the ones up ahead of Gizmo are moving away or quite slowly. 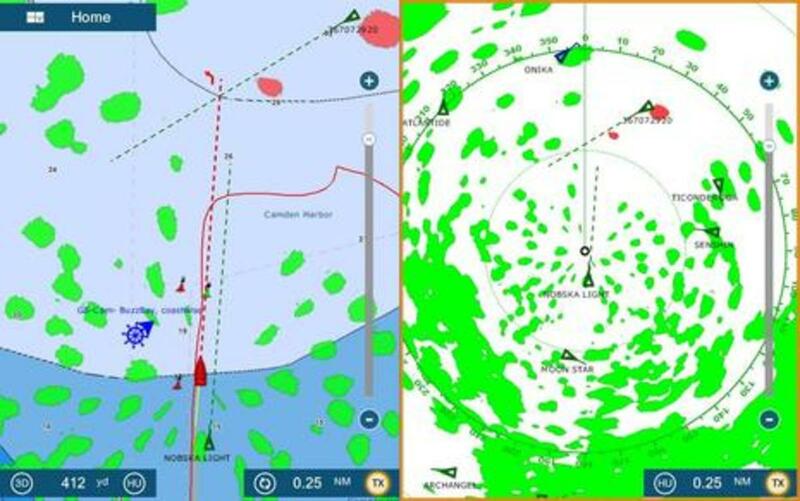 Similarly, the AIS target (and handsome trawler) Nobska Light behind Gizmo is not highlighted because it&apos;s not overtaking at more than 3 knots. 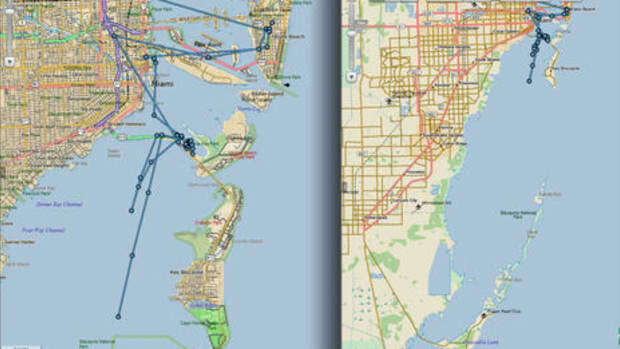 What are highlighted, however, are two boats that really were of concern, neither of which was particularly obvious even in broad daylight. Now you may be thinking that the NXT targeting looks a little rough, and that deserves discussion. For one thing, the right hand radar window is set at 0.25 nm range and slightly zoomed in, while the same range is showing on the much more zoomed in chart overlay window. I could, for instance, tap that Refresh button (near Nobska Light on the overlay) and the radar would instantly range down to a more zoom appropriate and better resolved 0.125 or 0.0625 nm range. I also could have put the NXT into truer color mode with RezBoost beam sharpening to maximize the target detail. But radar target detail becomes much less important once you&apos;re confident that the Doppler aids really work, and Target Analyzer&apos;s red highlights are just the beginning of what NXT does with Doppler. "Auto Acquire by Doppler" is found in the TZT2&apos;s Home/Settings/Radar menu and in my experience it&apos;s so good that it ought to be On by default. 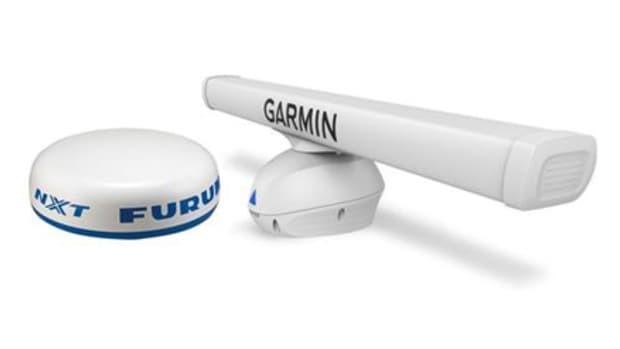 Furuno has long been the only company to offer ARPA, not MARPA, on recreational radars. 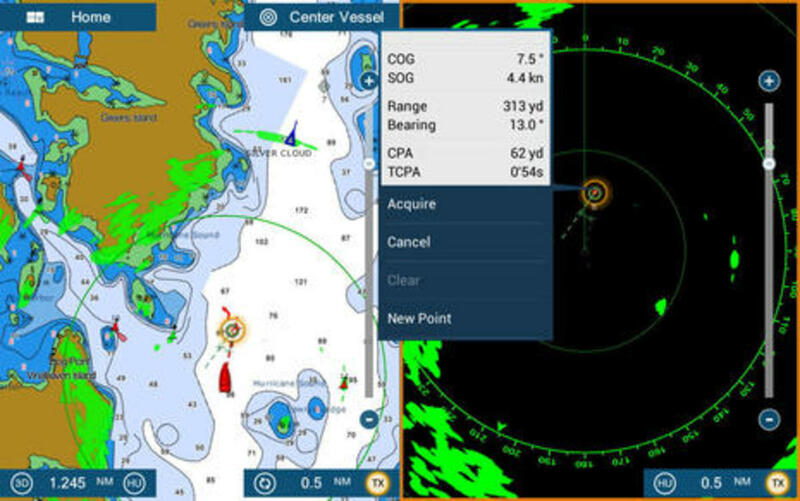 Not surprisingly, Automatic Radar Plotting Aid means that the radar can automatically lock onto targets and determine their course and speed, as well as the Closest Point of Approach (CPA) and Time of CPA (TCPA) that you and that vessel will experience as long as both maintain course and speed. Mini ARPA (MARPA) would be better named Manual ARPA because you have to select each radar target to acquire (though touchscreens have made that easier). At any rate, my testing indicates that Furuno has substantially outdone its own unique self; NXT&apos;s Doppler assisted ARPA is fast, accurate, and darn smart. 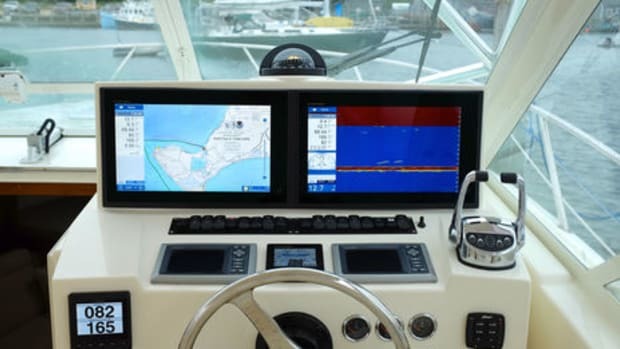 While it was impressive that the 19-inch DRS2D I tested could do ARPA at all, it had to be set up in a Guard Zone and it sometimes tracked nav aids and ledges as well as moving boats. NXT ARPA just works, rarely makes mistakes, and I find myself using it all the time, as you&apos;ll see on many of the following screens. Furuno, incidentally, calls this new level of ARPA "Fast Target Tracking," and again I believe that&apos;s justified. Here I&apos;ve headed back into Camden Harbor&apos;s main entrance while the NXT is making Doppler assisted decisions about which targets to track. Obviously, they&apos;re not just the ones that Target Analyzer highlights, as the single fully red target hasn&apos;t even been selected yet (it was a very fast outboard as I recall, and it did get quickly tracked shortly thereafter). The NXT also hadn&apos;t yet tracked the AIS equipped vessel Gizmo is leaving to starboard, but it was a daysailer nearly stopped as it set sail. But note target #4, which was coming in fast on Gizmo&apos;s port quarter and which Target Analyzer is just starting to paint red as it turned more toward Gizmo&apos;s path. ...and, dang, how nice it was to realize that the automatic Doppler target acquisition works even when Target Analyzer is not in use. This screen also shows how you can left swipe the TZT2 screen to get the Data Box with its Radar control tab. 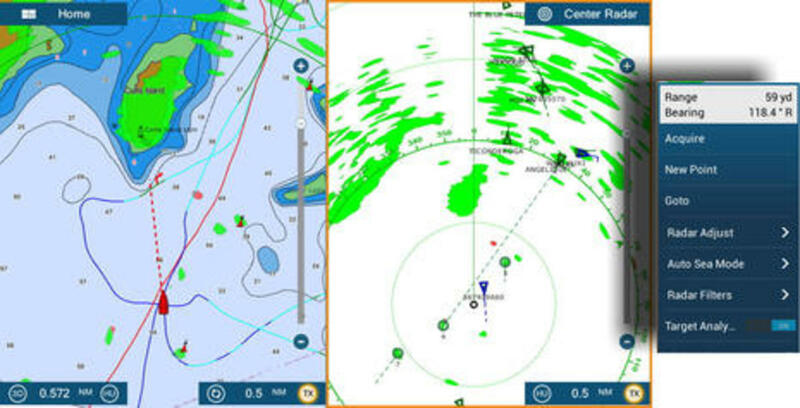 Here or from the Radar screen tap menu above -- there are often multiple ways to access controls on the TZT2 -- you can manually control radar gain as well as sea and rain clutter. But so far the auto modes have worked very well for me (and in Target Analyzer mode, they are all auto). In this scene I&apos;ve been loosely following a route up the Bay and those ARPA targets behind me were meaningful. The fact that the NXT has decided to track blob #25 strongly indicates that it is meaningful. Incidentally, NXT ARPA targets seems to work pretty much regardless of range settings. I can range in tight for minutes at a time and when I range out again, distant targets are still there and accurate. Wow. 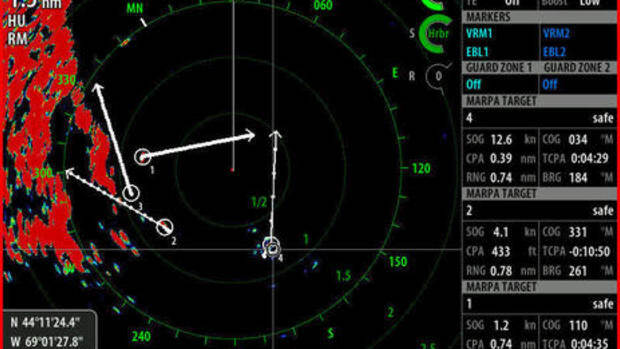 And that&apos;s not all.The NXT and TZT2 can also display a graphic Closest Point of Approach (CPA). If you click the screen above larger, you&apos;ll see that Gizmo will soon pass ARPA target #7 port-to-port and that the two connected "+" signs show when, where, and how the CPA will take place. I find this graphic much more informative than the numeric CPA and TCPA I could have gotten by tapping target #7, and that&apos;s especially true in a crossing situation when a CPA of, say. 0.1 nm does not tell if that&apos;s in front of or behind the vessel you&apos;re crossing. 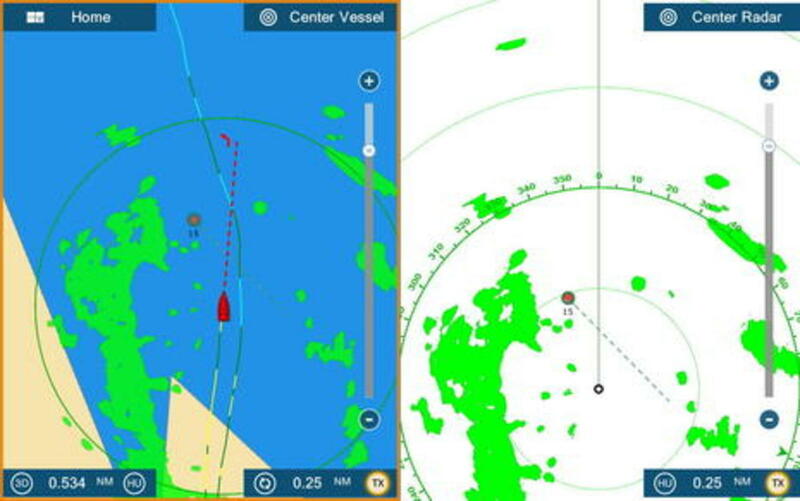 You may notice how my radar and chart overlay windows differ in terms of ARPA and AIS display. Those and many other data layers are easily controlled with the Layer menus you get by swiping up from the bottom of a TZT2 screen. 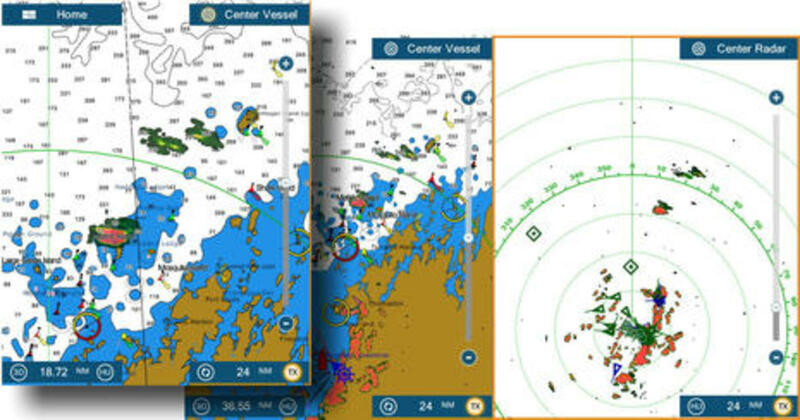 The image above shows what I get when the swipe is done on the Radar window side with Chart Layer collaged above. This is an easy, powerful interface and I&apos;m finding that I like different Layer mixes in different target density conditions. 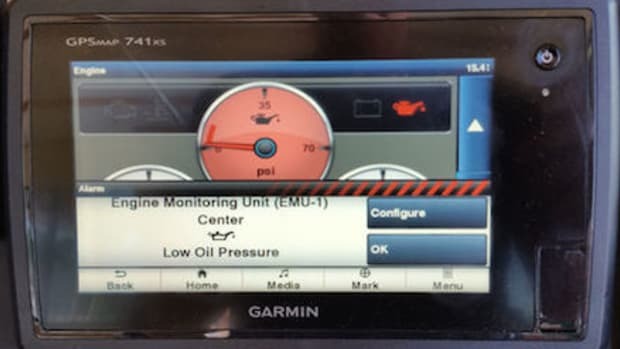 Note that full Active Captain info is available on the charts, and that these menus can be invoked in other ways including the new MCU004 Remote Control I&apos;m also testing. Here is a fairly extreme example of the DRS4D-NXT RezBoost beam sharpening feature at work on the TZT2. In the foreground, RezBoost is in "Standard" mode which seems to be essentially off as the targets are blobbed together and elongated in the way typical of a 24-inch radome with a 3.9 degree horizontal beam width. 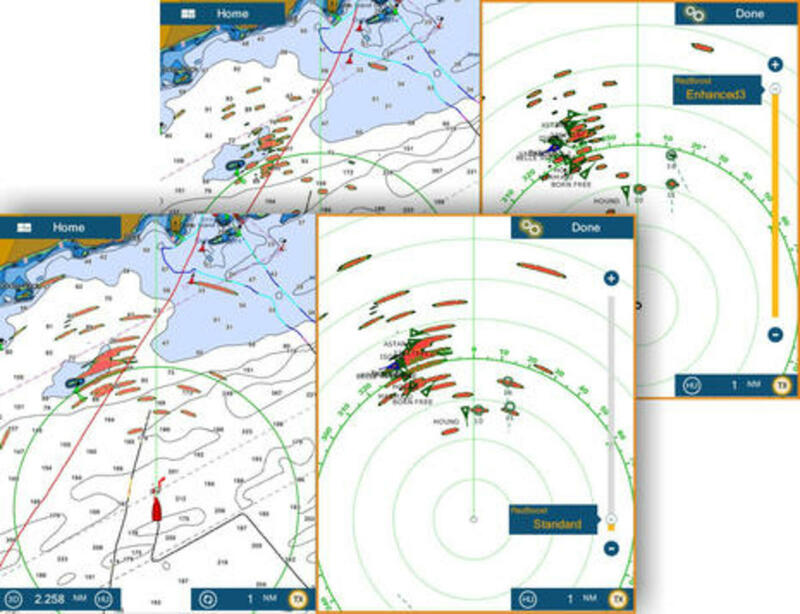 But with RezBoost at maximum Enhanced3, the gaggle of sailboats waiting for wind to start a race are better defined (as is the Heading error that shows on nav aids and in some of these screen shots). 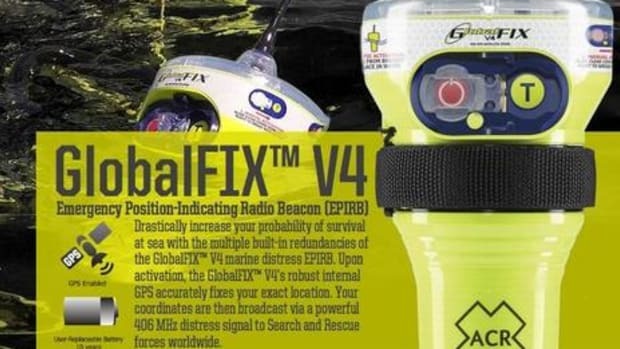 Furuno claims that RezBoost can effectively emulate a 2 degree beam width, and that seems true (as it is with other solid-state radars like the pioneering Simrad Broadband 4G). But again, target detail becomes a lot less important if you&apos;re confident that Doppler features will quickly highlight incoming vessels. And while I&apos;ve seen excellent NXT performance, all the testing so far has been in quite calm and clear conditions. If that race had ever started, for instance, I might have captured some memorable target screens. I also look forward to getting out in rain cells -- Target Analyzer has a mode for that -- and there will be a series of radome comparisons. The NXT also has a dual range mode, though it&apos;s limited to 12 nm range max and the NXT&apos;s antenna rotation stays at 24 RPM. Yes, in normal single-range mode, the NXT automatically chooses 24/36/48 rotation speeds, and those higher speeds must help the Doppler with the amazingly accurate tracking of fast, close targets. The DRS4D-NXT may not have the range of Furuno&apos;s similar size magnetron radars, but it&apos;s not bad. On the screens above, NXT is imaging Matinic Island at 17 nm and Monhegan (I think) at about 26. Click the collage bigger to see how I was able to pinch zoom and drag the chart overlay window to better see what was going on out there. The TZT2 is smooth and quick at screen manipulations like this, and it&apos;s dead simple to return to normal operations with on touchscreen control buttons like Center Vessel, Reset Range, Head Up / North Up, and more. Yesterday morning the TZT2&apos;s included NOAA-based vector and raster charts worked just fine again, and I&apos;ll conclude with two more NXT Doppler screens. Maybe I&apos;ve gone overboard, but have you ever seen a radome (or any recreational radar) able to automatically highlight and track like this? 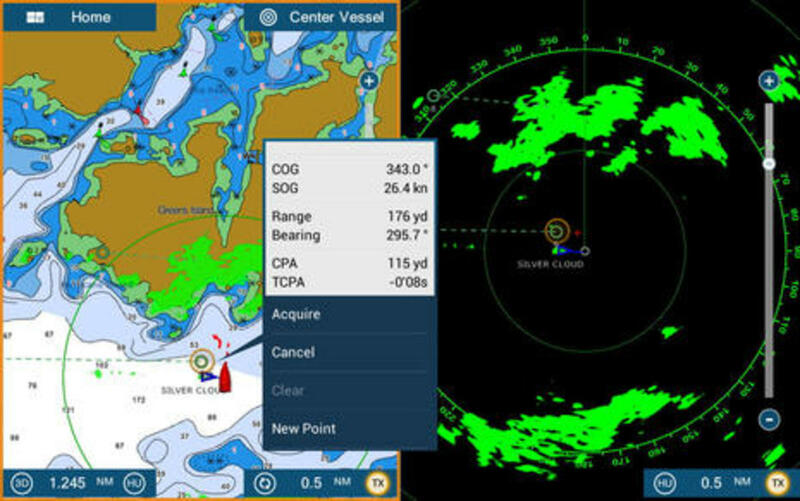 In the situation above, the sailboat was first shown by Target Analyzer, then detailed by ARPA, and finally the CPA was drawn on screen. I didn&apos;t do anything except tap the ARPA target on the radar window to pop up the numeric details, and note how the same target was then nicely marked on the chart window with an orange circle. A short time later I was ogling and photographing the fascinating SWATH superyacht Silver Cloud when NXT and noise alerted me about an open lobster boat crossing from the starboard danger zone so fast that I only captured the screen below after the fact. 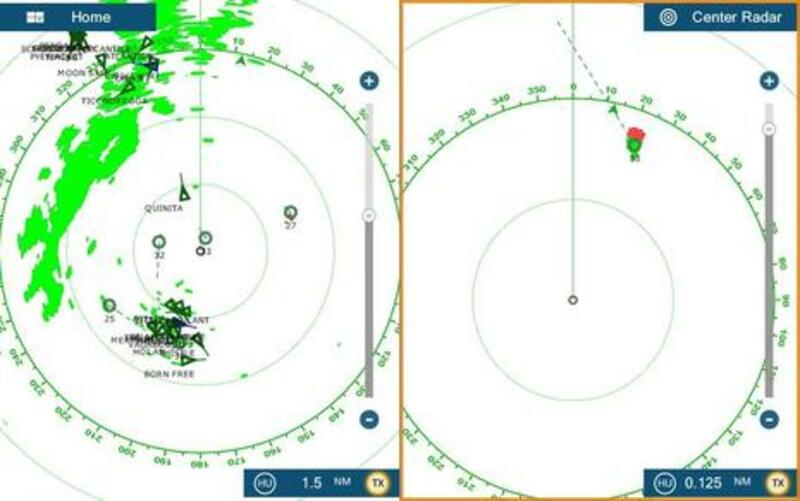 That&apos;s what I mean by radar that makes sense to run in broad daylight, and doesn&apos;t it look to be invaluable in fog or darkness? Congratulations to Furuno for the DRS4D-NXT, may the competition take heed, and sorry about the radar jealousy.